(MENAFN - The Conversation) Universities in the US have long wrangled over who owns the world's largest drum. Unsubstantiated claims to the title have included the ' Purdue Big Bass Drum ' and ' Big Bertha ', which interestingly was named after the German World War I cannon and ended up becoming radioactive during the Manhattan Project. Unfortunately for the Americans, however, the Guinness Book of World Records says a traditional Korean 'CheonGo' drum holds the true title. This is over 5.5 metres in diameter, some six metres tall and weighs over seven tonnes. But my latest scientific results, just published in Nature Communications , have blown all of the contenders away. That's because the world's largest drum is actually several tens of times larger than our planet – and it exists in space. You may think this is nonsense. But the magnetic field (magnetosphere) that surrounds the Earth, protecting us by diverting the solar wind around the planet, is a gigantic and complicated musical instrument . We've known for 50 years or so that weak magnetic types of sound waves can bounce around and resonate within this environment, forming well defined notes in exactly the same way wind and stringed instruments do. But these notes form at frequencies tens of thousands of times lower than we can hear with our ears. And this drum-like instrument within our magnetosphere has long eluded us – until now. The key feature of a drum is its surface – technically referred to as a membrane (drums are also known as membranophones). When you hit this surface, ripples can spread across it and get reflected back at the fixed edges. The original and reflected waves can interfere by reinforcing or cancelling each other out. This leads to ' standing wave patterns ', in which specific points appear to be standing still while others vibrate back and forth. The specific patterns and their associated frequencies are determined entirely by the shape of the drum's surface. In fact, the question 'Can one hear the shape of a drum?' has intrigued mathematicians from the 1960s until today. 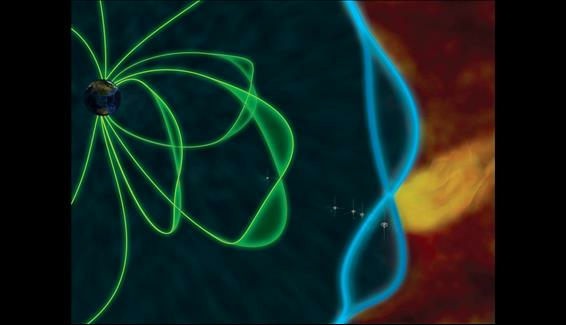 The outer boundary of Earth's magnetosphere, known as the magnetopause, behaves very much like an elastic membrane. It grows or shrinks depending on the varying strength of the solar wind, and these changes often trigger ripples or surface waves to spread out across the boundary. While scientists have often focused on how these waves travel down the sides of the magnetosphere, they should also travel towards the magnetic poles. Physicists often take complicated problems and simplify them considerably to gain insight. This approach helped theorists 45 years ago first demonstrate that these surface waves might indeed get reflected back , making the magnetosphere vibrate just like a drum. But it wasn't clear whether removing some of the simplifications in the theory might stop the drum from being possible. It also turned out to be very difficult to find compelling observational evidence for this theory from satellite data. In space physics, unlike say astronomy, we're usually dealing with the completely invisible. We can't just take a picture of what's going on everywhere, we have to send satellites out and measure it. But that means we only know what's happening in the locations where there are satellites. The conundrum is often whether the satellites are in the right place at the right time to find what you're looking for. Thankfully, NASA's THEMIS mission gave us not four but five satellites to play with. All we had to do was find the right driving event, equivalent to the drum stick hitting the drum, and measure how the surface moved in response and what sounds it created. The event in question was a jet of high speed particles impulsively slamming into the magnetopause. Once we had that, everything fell into place almost perfectly. We have even recreated what the drum actually sounds like (see the video above). This research really goes to show how tricky science can be in reality. Something which sounds relatively straightforward has taken us 45 years to demonstrate. And this journey is far from over, there's plenty more work to do in order to find out how often these drum-like vibrations occur (both here at Earth and potentially at other planets, too) and what their consequences on our space environment are. This will ultimately help us unravel what kind of rhythm the magnetosphere produces over time. As a former DJ, I can't wait – I love a good beat.